This picture and presentation is terrible! I will be making these again soon and will post a better picture next time! It has been quite awhile since I last posted. Honestly, I lost some passion for cooking. I became bored with the food I was making and needed a hiatus to regain some perspective. That perspective finally came while I was visiting my family last week in North Carolina. My brother and sister-in-law took me out to dinner to a tapas restaurant called Humble Pie (http://humblepierestaurant.com/menu/small-plates/) where we ordered about 9 or 10 tapas plates (my bro is a big guy!). Immediately after chowing down and devouring said plates, my sister-in-law said to me, "So, are you inspired now?" And I was. This dish comes from that inspiration. 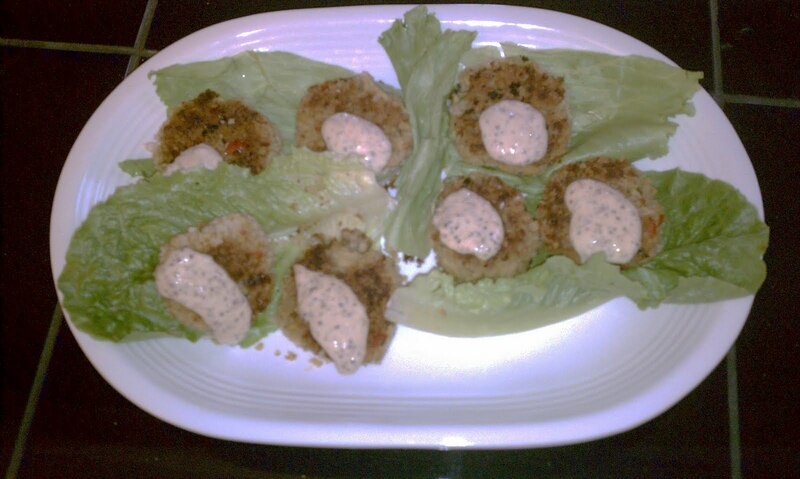 This is my rendition of vegan crab cakes. I hope you enjoy! Crumble the tempeh into a saucepan. Add the water, soy sauce, olive oil and bay leaves. The tempeh will not be fully submerged and that is fine. Cover and bring to a boil. Boil 12-15 minutes until most of the liquid has evaporated. Stir once during boiling. Meanwhile, in a small skillet, heat a tablespoon or so of olive oil over medium-high heat. Add the bell pepper, onion and celery and saute for about 5 minutes. Add the garlic and saute another 2 minutes. Turn off the heat and let the mixture cool for about 5 minutes before adding it to the tempeh mixture. Transfer contents of saucepan with tempeh mixture to a mixing bowl, remove the bay leaves and mash with a fork (I tried a potato masher-it does not quite do the job). Let cool for about 15 minutes, stirring occasionally. 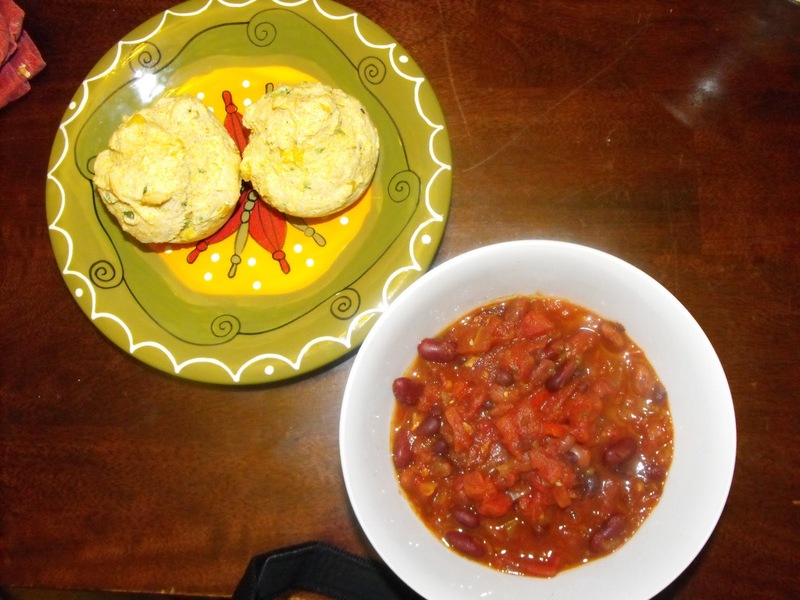 Make sure the tempeh is barely warm before you proceed or the cakes may fall apart when you cook them. Add the sauteed veggie mixture and stir thoroughly. Add the Vegenaise, hot sauce, lemon juice, Old Bay, salt and pepper and mix well. Add the breadcrumbs and stir to combine. Once you are ready to form the cakes, preheat a thin layer of oil in a heavy-bottomed, nonstick skillet (cast iron is great in this capacity) over medium-high heat. Pour some panko breadcrumbs into a bowl. Scoop a little less than 1/4 cup of batter into your hands and form into a ball. Flatten between your palms and then roll the sides gently to smooth them. You should have ten 2 1/2 to 3-inch patties. Press them into the panko to lightly coat. Fry a batch of five cakes for 4 minutes on one side and flip when dark golden brown. Fry for 2 minutes on the other side and transfer to a paper towel to drain excess oil. Prepare the second batch of cakes and in the meantime compose the remoulade by mixing all the ingredients together in a bowl. Saute tempeh bacon in a skillet over medium heat until heated through and a little crispy. Assemble salad with dressing and tempeh bacon. Combine all ingredients in a bowl and mix. Use an unsweetened milk substitute to thin out the dressing or serve as is. 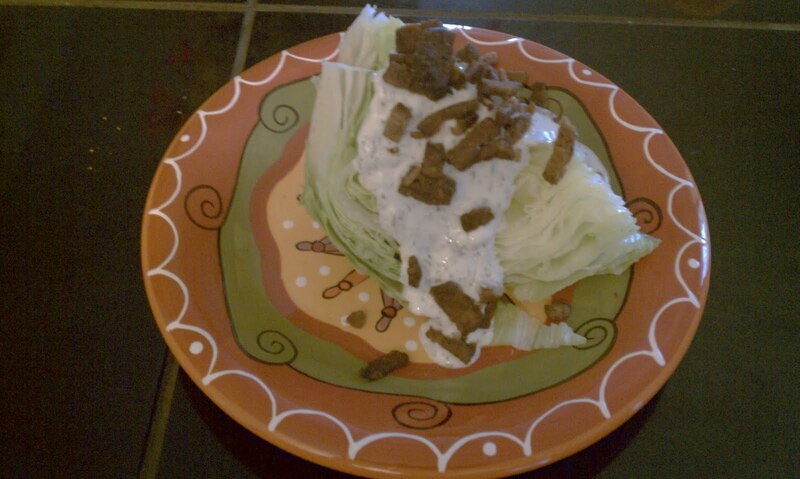 You will never buy store bought ranch again! 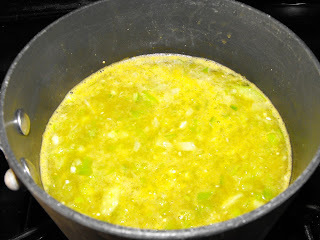 Mix together the soy milk, lemon juice and lemon zest and set aside to let thicken. Meanwhile, cream together the sugar and margarine with a fork or an electric mixer if you have one. Once the mixture is even, add the vanilla extract and soy milk concoction and continue to mix. In a large bowl sift the flour, baking soda, lavender and salt. Grind the whole lavender before adding to he mixture. I do this with a coffee grinder. Add the wet ingredients to the dry and work until the dough is even and slightly firm. Place the dough in the the refrigerator for a few minutes before rolling into balls and whenever the dough is not being used. Grind the whole lavender before mixing with the remaining sugar. 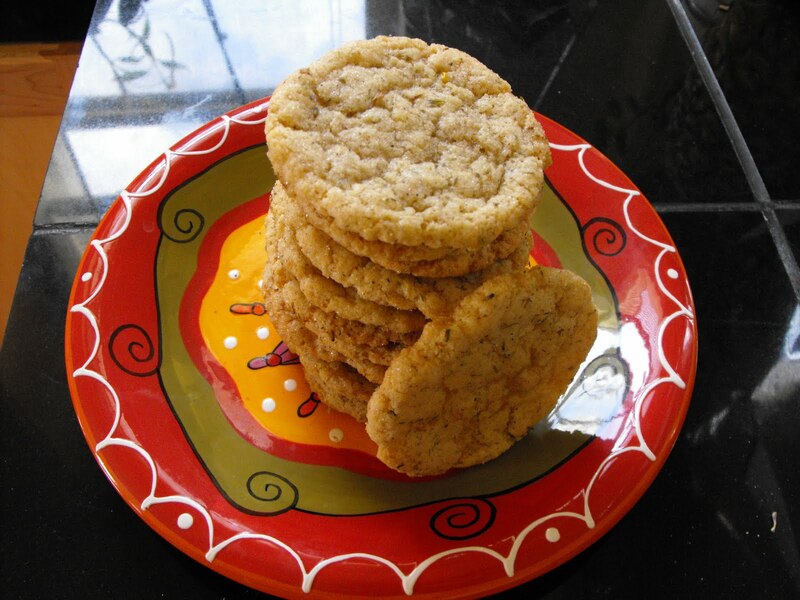 Mix the ground lavender and sugar on a large plate for rolling the cookies in. Spoon small, even amounts of the dough into your hands and roll into a ball, then roll evenly in the lavender sugar and place on a cookie sheet covered in parchment paper. Repeat for 6 cookies per pan, then press the dough flat with your hand, the bottom of a glass, or the back of a fork. Bake at 375F for 8-10 minutes. The cookies should no longer look fluffy but make sure to get them out before they brown too much around the edges. Let the cookies rest for a minute on the pan before placing on a cooling rack. 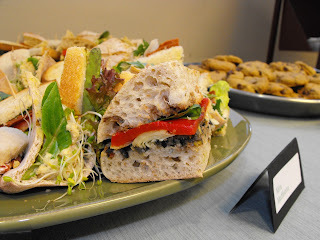 I had the amazing opportunity of catering a small luncheon for our local library. I made a delicious and light pasta salad, an organic mixed green salad, a sandwich tray with three different types of sandwiches and a platter of vegan chocolate chip cookies. Thank you Montrose Library! Make the pasta according to package direction. Drain and rinse with cold water to stop the cooking process. Place in a large bowl. 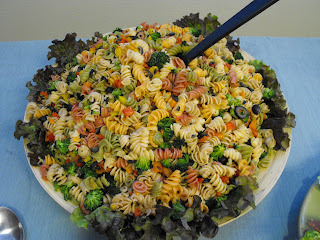 Add the broccoli florets, diced bell peppers and olives and toss. In a small bowl whisk together all of the vinaigrette ingredients. Coat and toss the salad until the salad is fully coated with the vinaigrette. Can be made one day ahead. 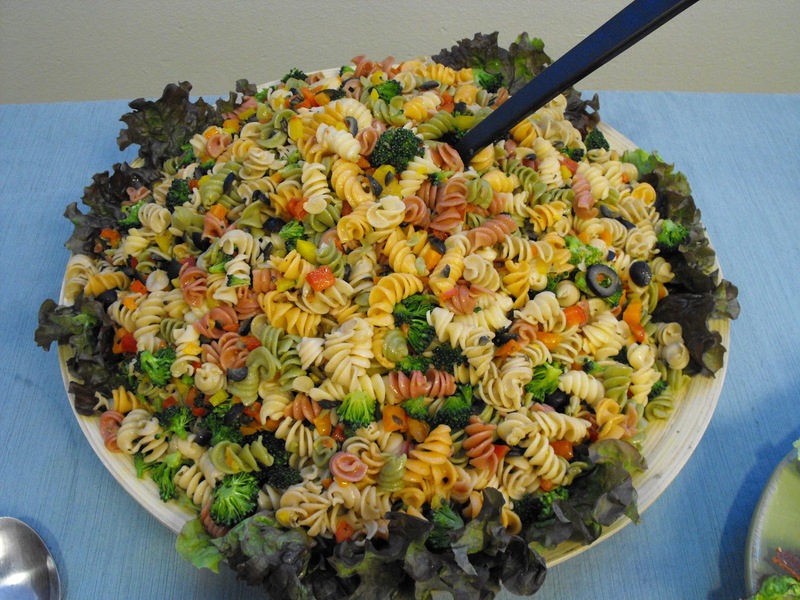 If making one day ahead you can reserve a little bit of the dressing as the pasta will soak up a lot of the dressing. Toss with the remaining dressing right before you are ready to serve. Place all ingredients in a food processor and pulse until chunky. Roast peppers on gas stove over medium high heat, charring on all sides. Place in a bowl and cover, let steam for approximately 10 minutes. 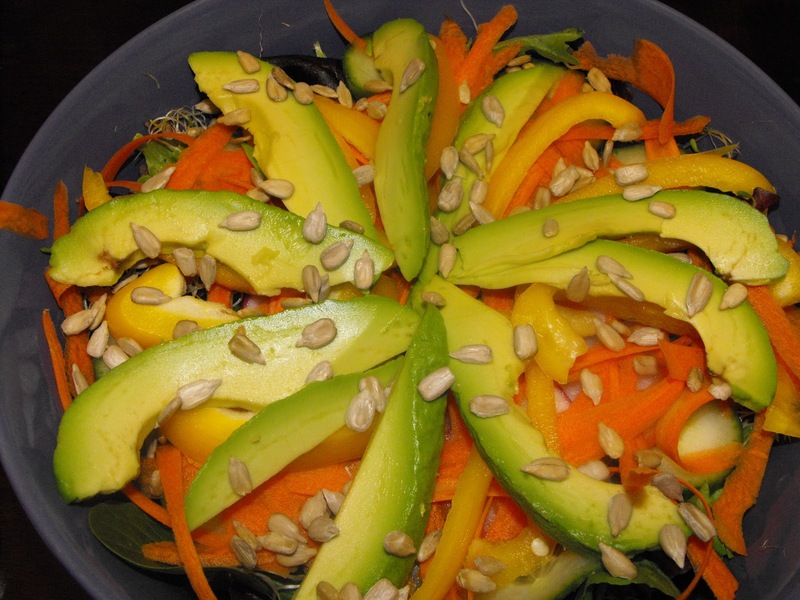 Remove skins and seeds and slice. Cut ciabatta bread in half. Drizzle balsamic vinegar on each side of the bread. Spread the tapenade over the bottom of the bread. Layer with artichoke hearts, roasted red peppers and basil. Cover with the top half of the bread, press gently, slice and serve. Put the first three ingredients in a food processor and pulse 3-5 seconds. If you do not have a food processor, dice the onion and celery and smash the chickpeas with a fork or potato masher. Scoop mixture into a bowl and add remaining ingredients. Season with salt and pepper to taste. Stuff it into pitas with sprouts and lettuce, grill it on bread or try it wrapped up in a lettuce or collard green leaf. Butter the outside of sourdough bread. Grill the bread butter side down and the bacon. Assemble sandwich and serve. I love, love, love her site and she has copious amounts of vegan recipes, too, which makes me very happy! 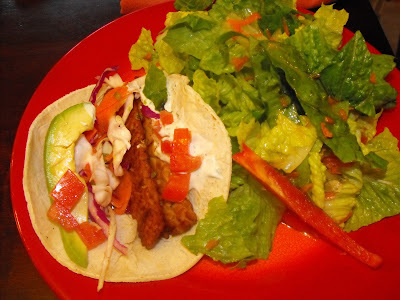 Karina's food is always delicious and her pictures are amazing. My pictures for this dish turned out horribly so these are her beautiful pictures. Heat the olive oil in a large skillet over medium heat and stir in the onion and garlic. Add the carrots, zucchini, and broccoli. Stir and cook lightly until fork tender, roughly ten minutes. If you prefer your veggies crisper, cook only until tender-crisp. Add peas and season with sea salt and ground pepper; set aside. 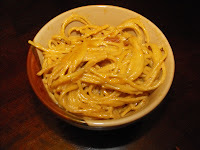 Heat the olive oil in a pot over medium-low heat; stir in the rice flour to make a paste. Stir and cook for half a minute. Slowly add in the warm non-dairy milk, and keep stirring. Add the vegan butter, nutritional yeast, and sea salt. When it begins to thicken remove from heat and taste test. It should taste mild and creamy. The herbs in the veggies will add rosemary-sage flavor. Boil the potatoes in a pot until fork tender, about 25 minutes. Drain well. Mash with a potato masher; add a splash of vegetable broth or non-dairy milk, the butter and season with sea salt, to taste. 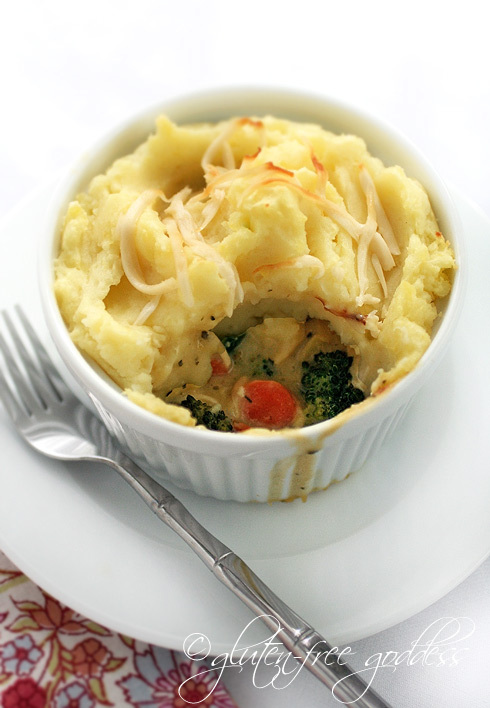 Stir till smooth and creamy, adding a little more broth or milk until the potatoes are fluffy and smooth. Set aside. Pour the gravy over the filling mixture and gently mix until the veggies are coated with gravy. Spoon the filling into the ramekins. 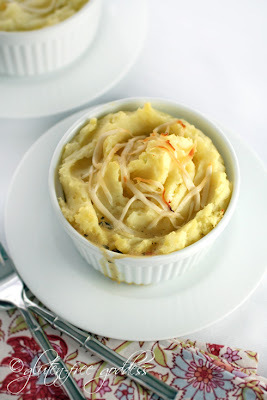 Top with a big spoonful of mashed potatoes. Sprinkle with non-dairy shredded cheese, if you like. Place the ramekins on a baking sheet (to catch any bubbling-over drips) and bake in the center of a hot oven for 30 to 35 minutes. I tented my ramekins with foil for the first half of baking time to keep the mashed potatoes moist. Then I removed the foil and let the the topping brown a bit. Preheat the oven to 350 degrees F. Grease four single serving 10-oz ramekins with vegan buttery spread (I used Earth Balance). Set aside. The last three recipes I have posted have been Mexican fare. I am not really sure how that worked out as such as my cooking has been largely sporadic over the past few weeks. I guess these are the dishes I remembered to take pictures of! After not posting for so long, we have sat down to eat a meal and halfway through it dawns on me that I did not take pictures. Wah wah wah. Anyhow, this recipe is adapted from Vegan With a Vengeance therefore I think I can post it because I have tinkered with it quite a bit. In a stockpot, saute the onions in the oil over moderate heat for 5 minutes. Add the garlic, cumin, salt and pepper. Saute 1 minute more. Add the chipotles, tomatoes, and water, stir. Add the potatoes and carrots, bring to a low boil, and simmer for 20 minutes. Uncover, add the corn and beans. Thin with more water if needed. Cook uncovered for 5 more minutes. Add the cilantro, lime zest, and lime juice. Let sit for at least 10 minutes. Serve. Long time no post...holy hectic life, Batman! I know, I know, I totally fell off the radar there for awhile. What has it been, like three weeks since I posted? Sheesh-time flies. Rest assured, I am alive and kicking. 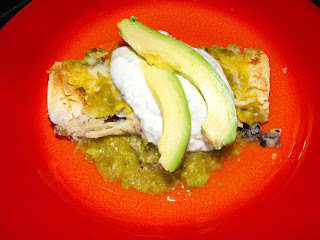 As will be your taste buds after taking a bite of these delicious enchiladas (like my segue there?!). If you are not familiar with tomatillos, they look like small green tomatoes in a papery husk. They are a bit on the sour side with a hint of citrus flavor which adds a nice bright note to this dish. This dish incorporates 4 of the 7 "Latin Powerfoods": garlic, cilantro, avocado and tomatillos. 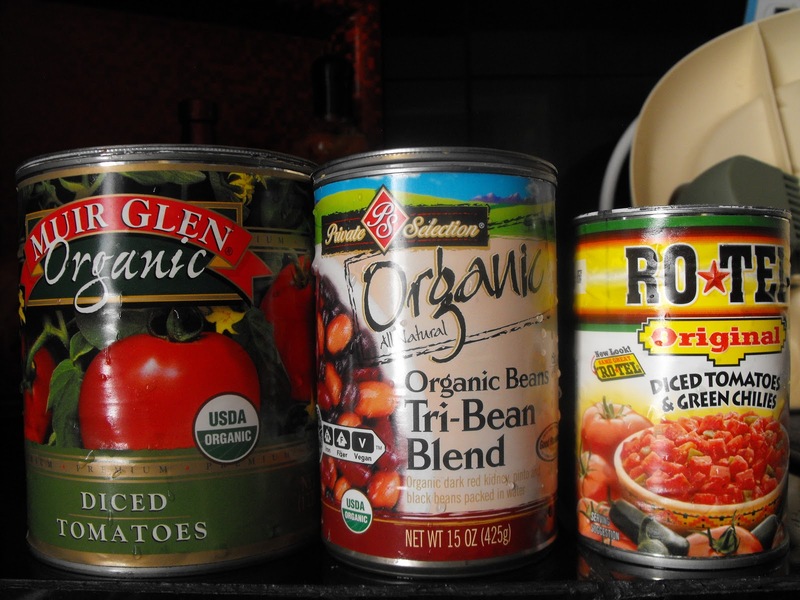 Each of these four powerfoods have amazing health benefits. Garlic is a natural immune-booster and anti-microbial; cilantro is a detoxifying herbal plant; avocado has healthy monounsaturated oil; tomatillos have more nutrients than regular tomatoes and high in antioxidants. 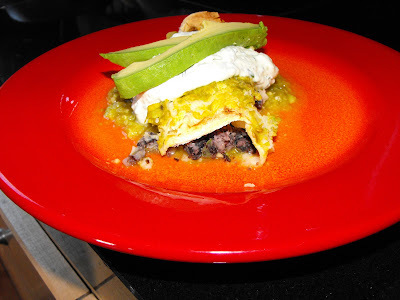 To make Black Bean Filling: Heat oil in large skillet, and add onion, jalapeno and garlic. Cook for 1 to 2 minutes. Add beans, and mash with back of a fork. Stir in cumin and season with salt. Reduce heat to low until enchiladas are assembled. To make Warm Salsa Verde: Place tomatillos in a food processor, and pulse to a coarsely ground paste. 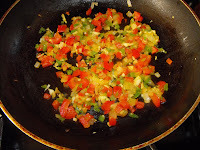 Heat oil in large skillet, and add onion, jalapeno and garlic. Cook for 1 to 2 minutes and add ground tomatillos. Simmer tomatillos with onion for 5 minutes. Add stock and seasonings. Halve avocado with skin on by cutting in and down to the pit all around avocado. Separate avocado halves, and scoop out pit with a large spoon. Scoop flesh out of skins and into pot. Mash with back of a fork. Stir avocado into sauce to thicken it. Return sauce to a gentle boil. Reduce heat to low until enchiladas are assembled. Scoop some sauce onto bottom of a casserole dish or shallow serving platter. To make an enchilada, place 1 to 2 scoops of filling down center of a tortilla, and roll. 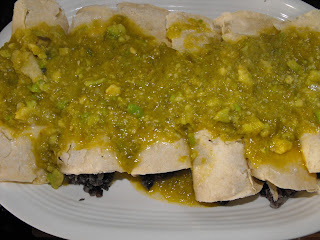 Place filled tortillas seam side down into sauce on platter or casserole. Line up tortillas, one next to another, and top with remaining sauce. Serve immediately with Warm Salsa Verde. 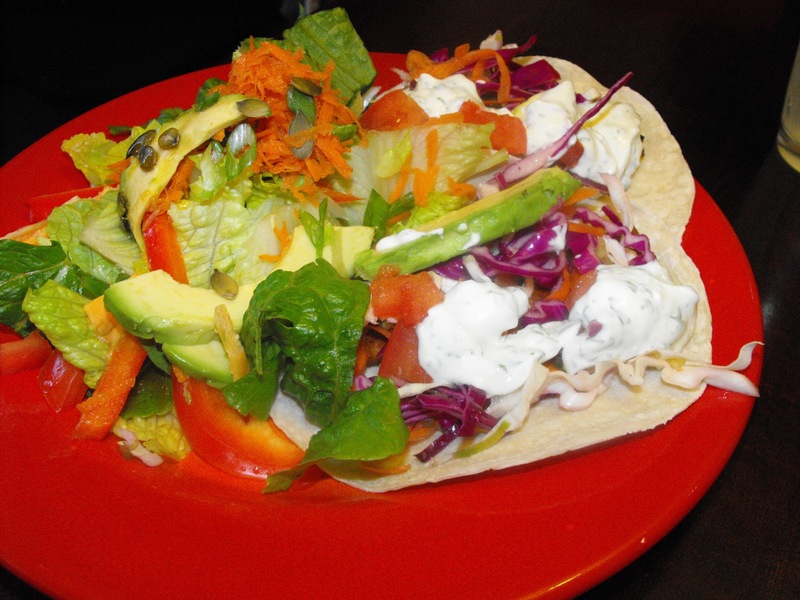 Shown above topped with homemade cilantro-lime-avocado sour cream and avocado slices. I, for one, am happy to see asparagus back in the super market produce selection. Thank you California! The best place to buy asparagus is from your local farmer's market, however, it is not quite time in Colorado to be picking asparagus as there are still inches of unmelted snow covering our land. I am looking forward to April and May when we get the freshest, local asparagus. Did you know that asparagus is a member of the lily family? It is also a natural diuretic and loaded with a myriad of vitamins and minerals such as Vitamin C and K, folate and potassium. Folate...that sounds familiar. Oh yeah, folate, the B vitamin that naturally occurs in food that doctors are always telling pregnant women they need a supplement for (which is actually folic acid). Rest assured, folate is a naturally occurring vitamin in leafy green vegetables (go figure, right? 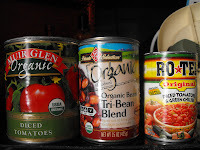 ), fruits (especially citrus fruits), and dried beans and peas. In fact, the folate in prenatal vitamins is actually folic acid, a synthetic form of folate...so you are not actually getting folate in those prenatals, you are getting a denatured form of folate. Best to get your nutrients from whole foods...real, living, food. Educate, educate, educate yourself about the best forms of food to put into your body. It if comes in a box, plastic, has more than 5 ingredients in it or comes in a pill form, put it back on the shelf! In a large sauce pan or a kettle bring 1 quart of water to boil. Have ready a medium sized glass or metal heat-resistant bowl. Heat a cast iron skillet over medium heat. While skilled is heating slice open dried chiles, remove stems and seeds and open chilies so that they can be easily flattened when pressed with a spatula. Place chilies in heated skillet, pressing and stirring frequently to toast, a little less than a minute. Watch carefully to prevent chilies from burning. Remove skillet from heat and place chilies in a heat resistant bowl. Pour boiling water over chilies and set aside for 10 minutes, allowing chilies to soften. Drain water from chilies. In a large sauce pan combine oil and onion and cook over medium heat until onion is translucent about 5-7 minutes. Add chopped garlic and stir frequently until sizzling and fragrant for about 1 minute. Stir in oregano and cumin, then pour in softened chilies, tomato sauce and vegetable stock. Either use an immersion blender or pour into a blender jar and puree mixture to create a smooth sauce. Return to the sauce pan if the blender jar is used. Bring pureed mixture to a simmer over medium heat and stir frequently, about 10 minutes. Season to taste with salt. Set aside. Heat broiler. On a rimmed broiler-proof baking sheet, place the pappers cut-side down. Broil until tender and charred, turning the peppers halfway through, 5 to 8 minutes.Spread half the chili sauce in a 9-by-13 inch baking dish. Arrange the peppers in the dish, cut-side up. In a medium saucepan, bring 2 1/4 cups water to a boil. Add 1/2 teaspoon salt. Gradually whisk in the polenta. Cook, whisking constantly, until thickened, 3 to 4 minutes (if you are using non-instant polenta, this will take about a half hour so account for time while preparing other parts of the dish). 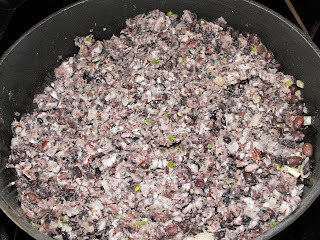 Stir in the corn, black beans, cheese, and all but 2 tablespoons of the scallions. 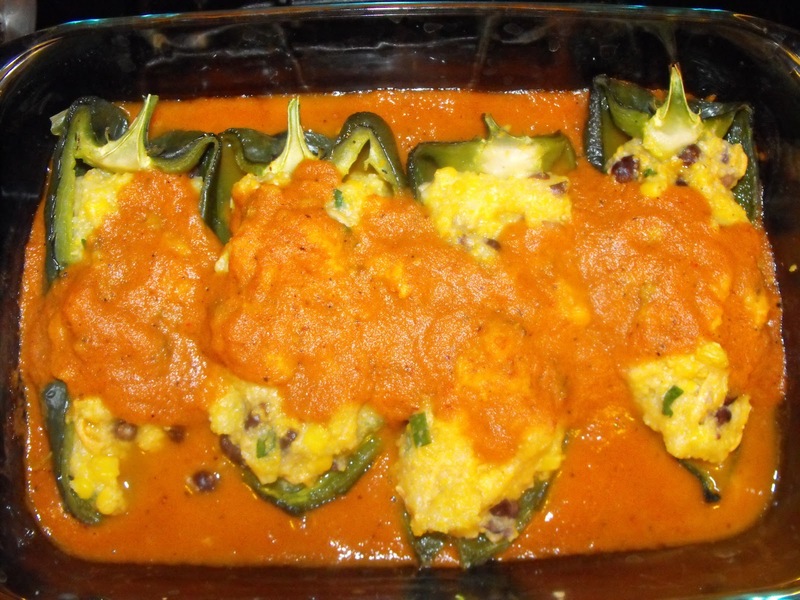 Divide the polenta among the peppers. 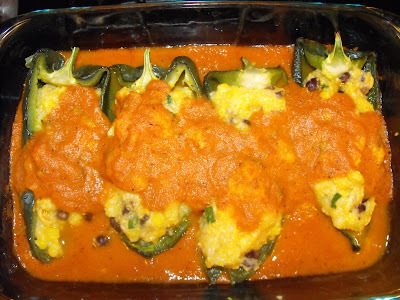 Top with the remaining sauce and bake until heated through, 5 to 10 minutes. Sprinkle with the remaining scallions before serving. "Really? 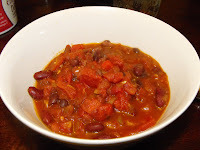 You are posting a chili recipe? Everyone knows how to make chili!" Ok, that is enough from the peanut gallery. Yes, I know, chili, how boring-it is like posting a salad. This, however, is what we had for dinner tonight, and my goal is to post all dinners made sans repeats. So, a chili recipe it is! And what is so wrong with trying new ways to make chili anyway...sheesh! Put first set of ingredients in a crock pot on low temp setting. Heat oil in a small pan over medium heat. Add all ingredients and saute for 4-5 minutes until tender. Add to crock pot. Cover with lid and cook approximately 2 hours. Serve with homemade cornbread muffins. 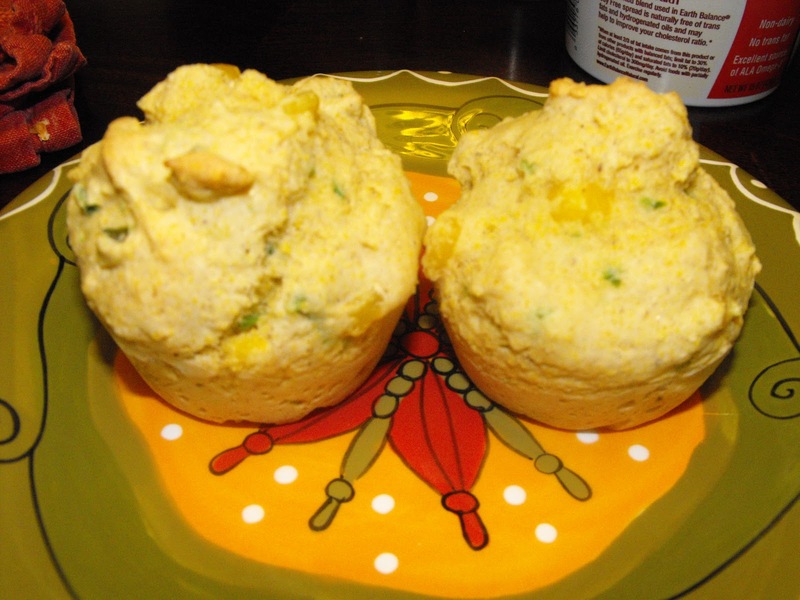 I bought a package of Bob's Red Mill Cornbread Mix, nixed the eggs using egg replacer, and added jalapeno and corn. It is delicious with butter and agave. 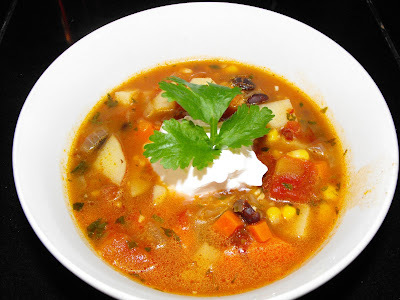 I adapted this recipe from one of my favorite veggie restaurants in Denver. This is Shannon and my best friend, Melissa's, favorite sandwich to get at the restaurant. 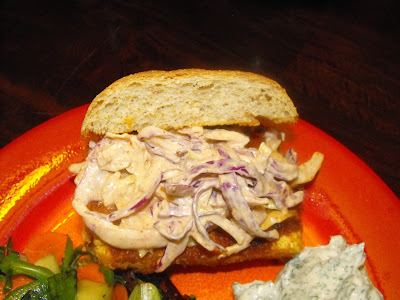 Crispy breaded tofu covered in classic buffalo sauce on a locally made bun with chipotle coleslaw equals heaven. Seriously, this sandwich is amazing! Mix all ingredients together. Cover and refrigerate while preparing tofu. This gives your slaw time to mellow and increase in deliciousness. Slice tofu lengthwise into 3 or 4 slabs. Marinate tofu in buffalo sauce for 30 minutes (this is to enhance the buffalo flavor. If you do not have this kind of time, just dip the tofu in the sauce. In a medium frying pan on medium heat, heat oil or butter. Add tofu slices and fry on each side for approximately 3-5 minutes. Remove tofu from pan and dredge in breadcrumbs. Add a little more butter or oil to pan, return tofu to pan, increasing heat to medium-high. Fry tofu on both sides for approximately 10 minutes until crispy and golden brown. Turn heat off. Gently pour remaining sauce/marinade over tofu slices. Place on a lightly toasted bun and top with chipotle coleslaw. We like to eat the coleslaw as a side, too! Serve with carrot and celery sticks with homemade ranch dressing and a green salad...and extra napkins! YUM! Sloppy Joe's are definitely on my top ten list of favorite meals. I never liked Sloppy Joe's before I became vegan. I guess a bun full of ground meat and ketchup just was not appealing to me. 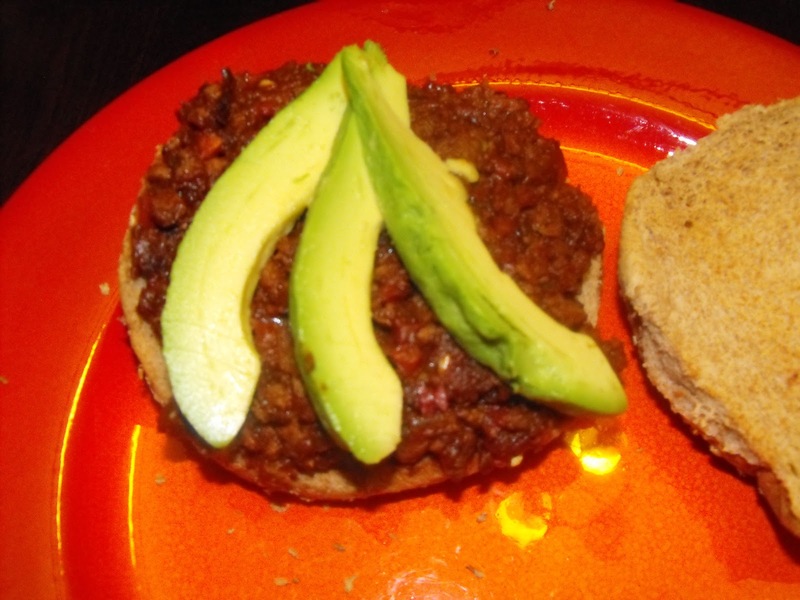 Enter Boca Crumbles and homemade Sloppy Joe sauce. Guaranteed this sammich will win over even the staunchest carnivore. Just do not tell them it is vegan until after they have devoured the entire thing and have sauce dripping down their chins. Heat oil in a medium skillet over medium heat. 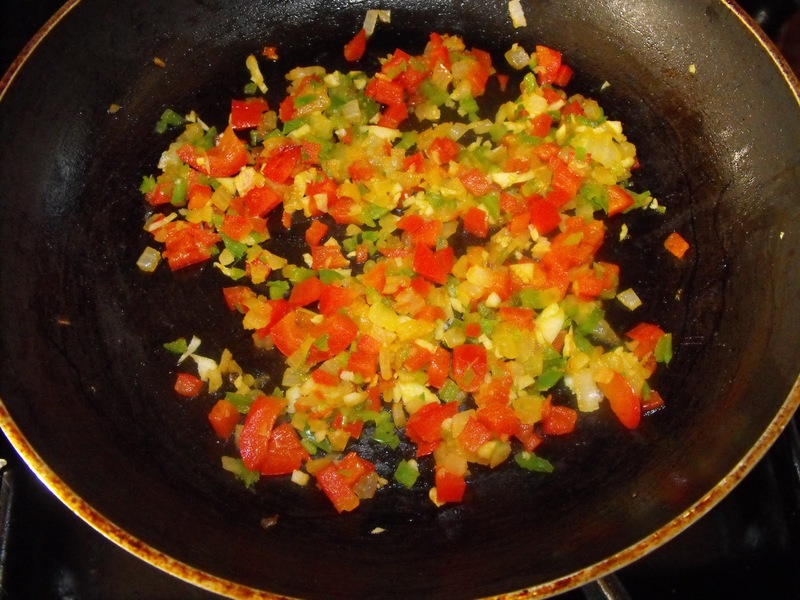 Add onion and bell pepper and saute for about 5-7 minutes. Add garlic and saute another 30 seconds. Add crumbles and cook for approximately 7-10 minutes. Mix in chile powder, oregano and mustard powder. Add tomato sauce and mix until incorporated. Lower heat to medium-low and cook for 10 minutes. Add maple syrup, salt and pepper to taste and serve. I like to top mine with avocado slices. Serve with a green salad. These used to be a mainstay at our house until we laid off of mushrooms for awhile. These are so rich in flavor and delicous. 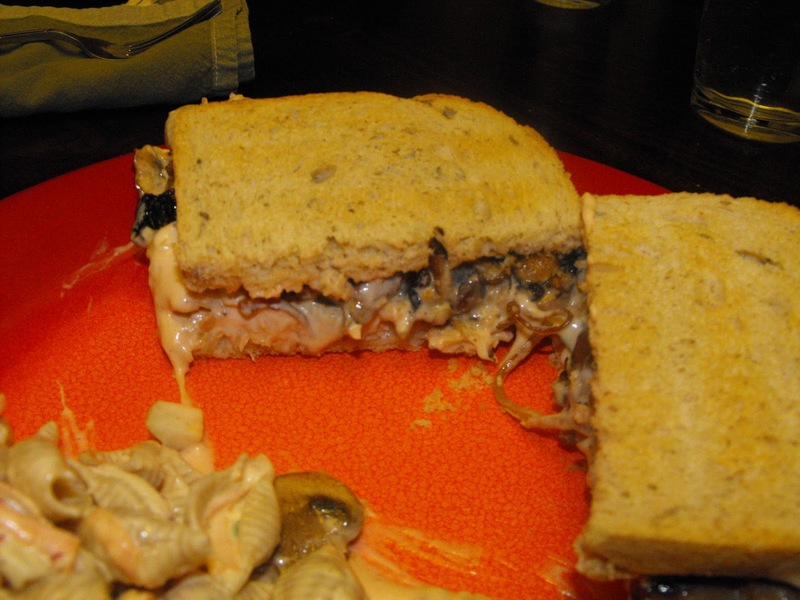 From the sauerkraut to the homemade thousand island to the marianted mushrooms, this is a sandwich you will not be able to put down until the last bite is gone! This is one messy sandwich so make sure you have plenty of napkins. 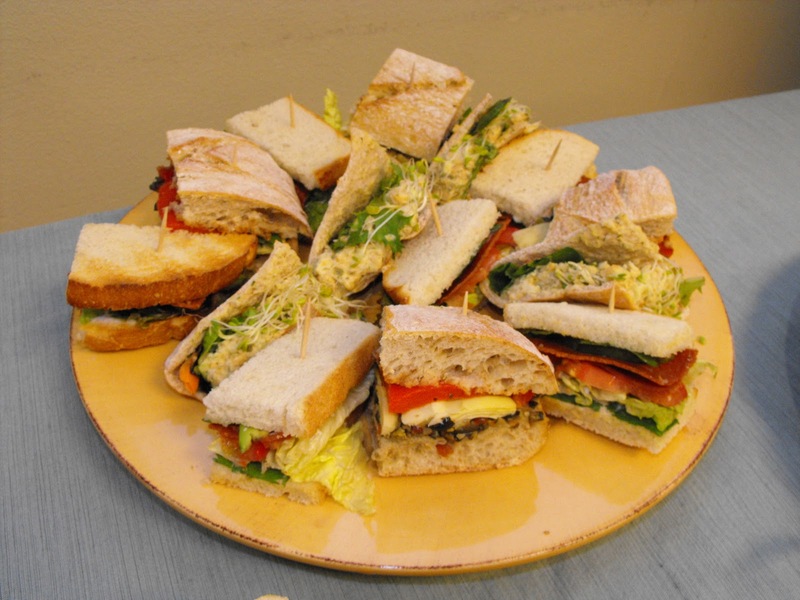 We could each barely finish our whole sandwich-we usually split one, but we thought we could each eat our own...we were wrong! Heat oil in a medium size skillet over medium heat. Add onions and saute until translucent and fragrant. Add mushrooms and sprinkle with a little salt. Let the mushrooms cook down and brown, approximately 7-10 minutes. Meanwhile, cover the portobello mushroom in a marinade (I use a little balsamic vinegar, soy sauce and spices) and bake it or saute it for about 10 minutes until it is soft. I just put mine in a toaster oven on bake at 350 for about 10 minutes. Remove and cut into a large dices. Divide the sauerkraut between two pieces of bread. Place all 4 slices of bread in the toaster oven and toast for about 7 minutes until bread is slightly brown. Mix all of the ingredients together. Spread evenly between the two sammiches. 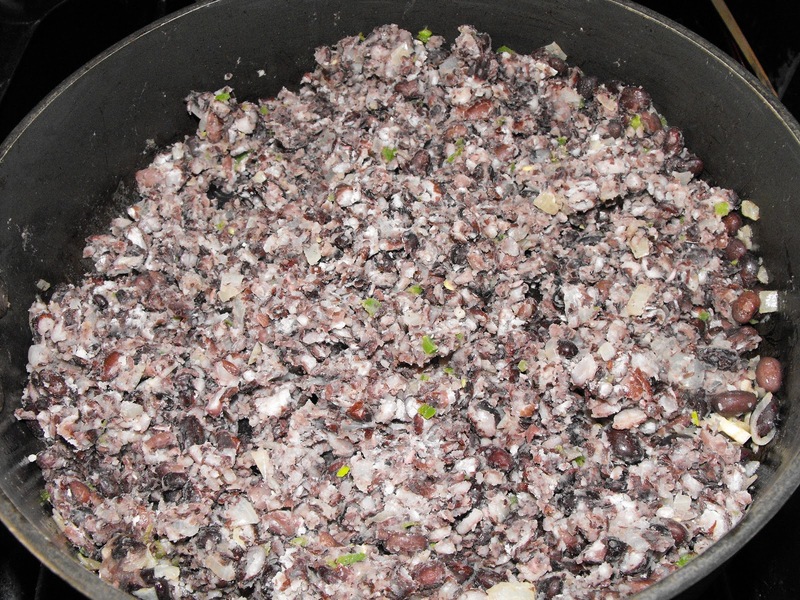 Top with the mushroom mixture and serve. 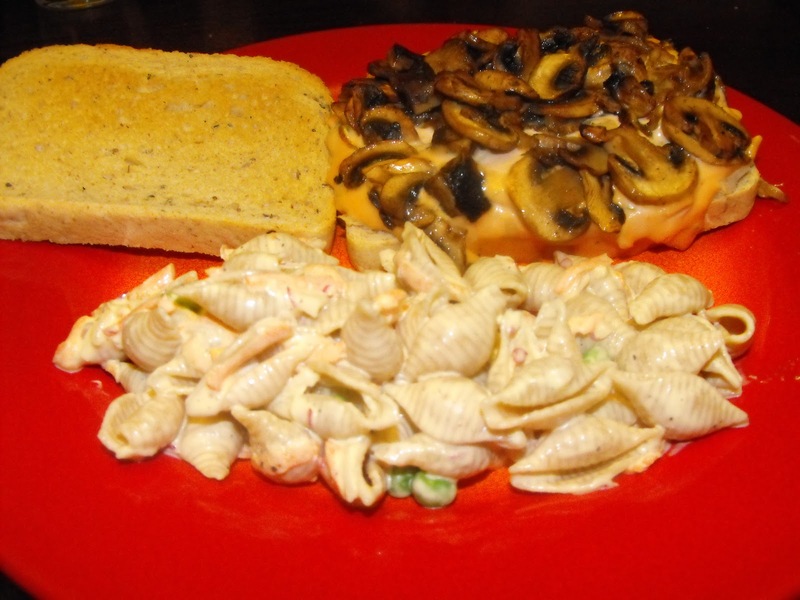 We served our reubens with Veganomicon's Brooklyn Deli Macaroni Salad. 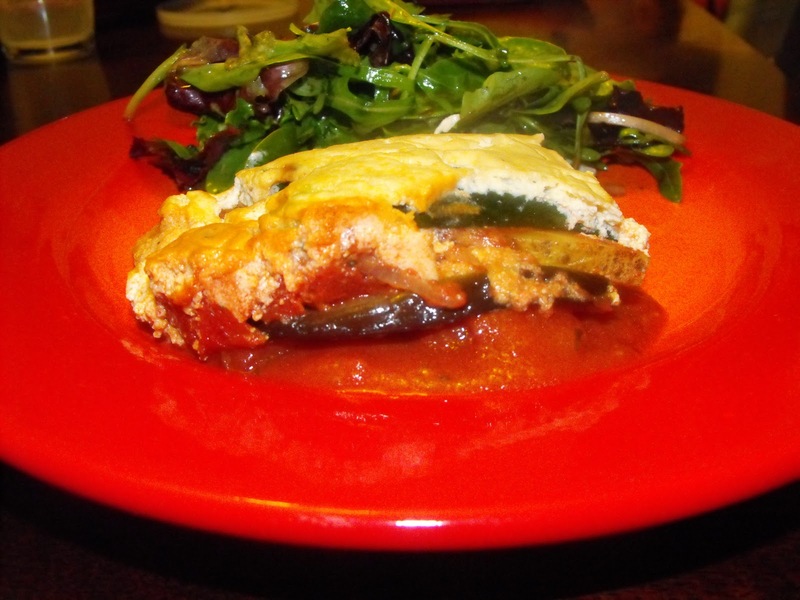 The first time I had ever heard of Moussaka was in the movie My Big Fat Greek Wedding where she was talking about being a swarthy 8 year old and bringing weird food to school. A girl asked her what she was eating and she said "moussaka." The girl then replied "moose-caca? hahahaha!" Oh kids...I remember being silly like that. Where did my innocence go? This was last night's dinner-Veganomicon's Moussaka. I never quite follow recipes to the T and it always works out in my favor. This dish calls for bread crumbs and an extra layer of veggies which I did not have. Weird because I bought the exact amounts of veggies the recipe called for. I marked in my book that I actually need double in order to make it two layers. There is something about opening my cookbooks and seeing food splatters and crossed out measurements with my own next to them. I dig it. Again, I do not think I can post the recipe without the authors' permission, but I am sure you can find it online somewhere. Try www.theppk.com. I love this dinner: spicy peanut noodles, marinated cucumbers, edamame and bok choy. Yum! It is nice and light, which I love. 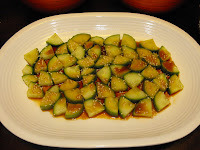 My favorite are the cucumbers-they are just so crisp and yummy and somehow taste amazing with tamari, rice wine vinegar and dark sesame oil. Cook pasta according to package directions. Meanwhile, mix remaining ingredients together in a mixing bowl. 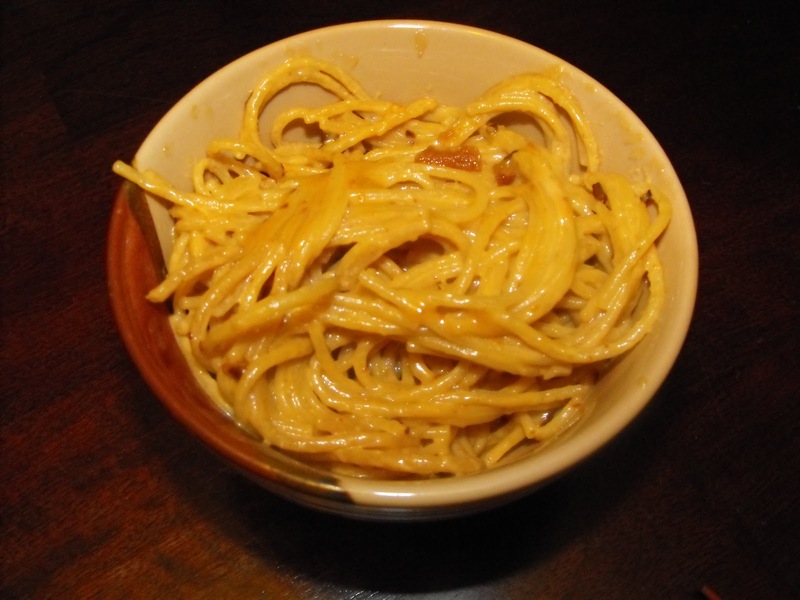 When pasta is done, drain and add to peanut sauce. Lay out cucumber pieces on a large, flat serving dish. 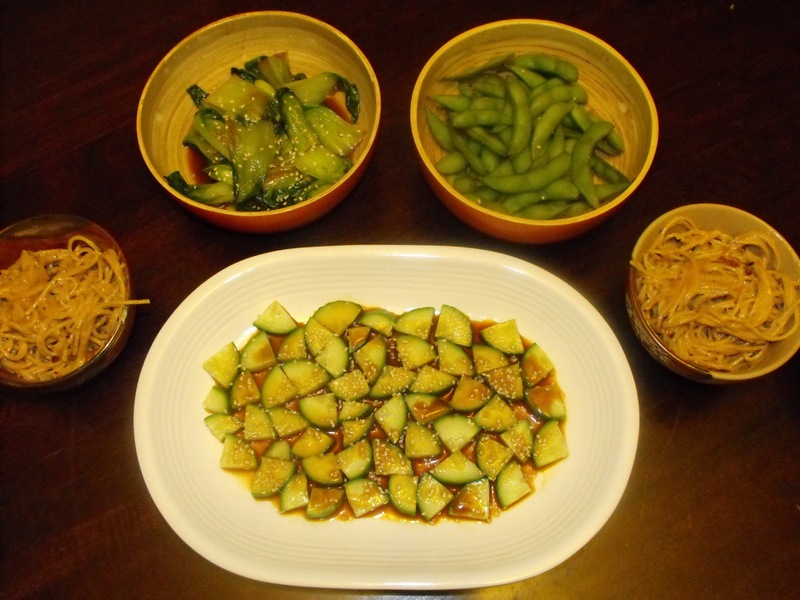 In a small bowl, mix together soy sauce, vinegar and sesame oil. Pour over cucumbers. Garnish with sesame seeds. Heat peanut oil in a medium skillet over medium-low heat. Add garlic and saute 30 seconds until fragrant. Add bok choy leaves and water or vegetable broth. Cover and steam until wilted approximately 3-4 minutes. Add soy sauce, sprinkle with sesame seeds, serve. It is money well spent! I am sure you can find the recipe online somewhere. 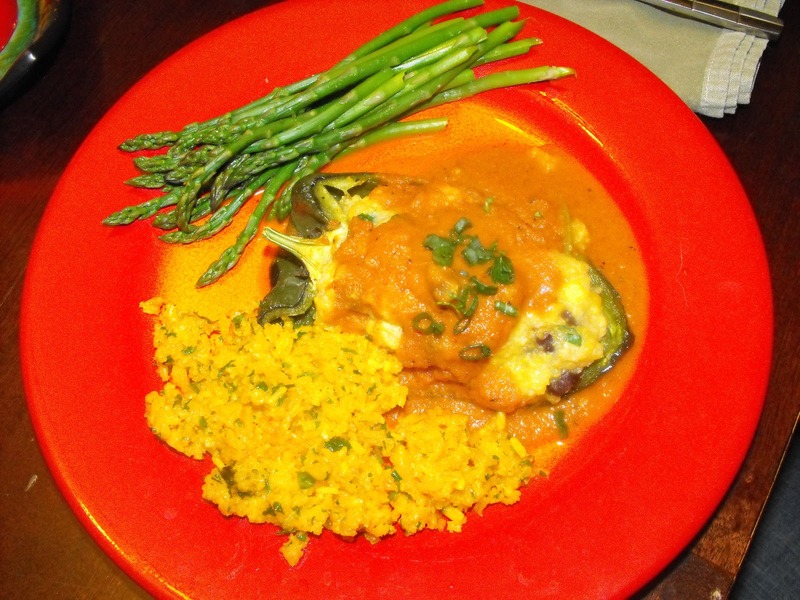 In fact, while I was trying to find pictures of this dish (there is not one in the cookbook), I came across a site that posted the recipe. 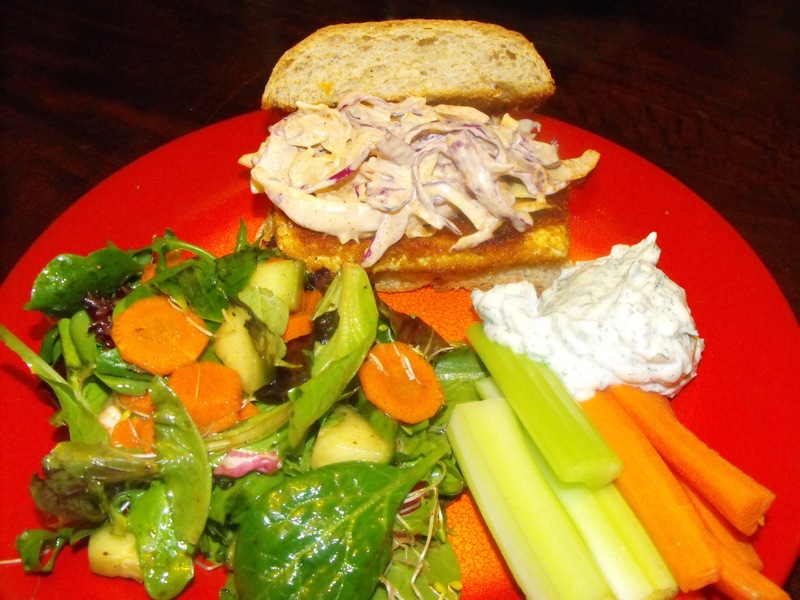 This is one of my favorite dishes to make for lunch. It takes 15 minutes, is light, healthy and full of nutrition. Heat the oil in a skillet over medium heat. Add the onion and saute about 3 minutes. Add the zucchini and squash; sprinkle with a little salt and saute, tossing often, until just tender about 4 to 5 minutes. Add the chickpeas, garlic, and spices and cook until heated through, 2 to 3 minutes. 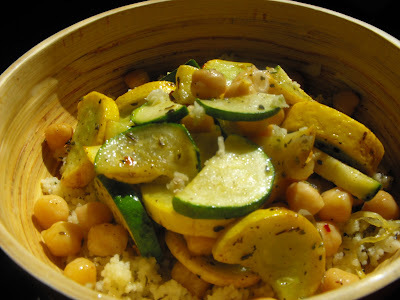 Serve over herbed couscous. Cook 1 serving of couscous according to package directions. Before serving, sprinkle in a little thyme, basil and butter. Fluff.